I often think spiders would have better luck with their webs in urban settings if they had a little sense of spots to avoid, such as where us lumbering humans come barrelling through without looking (or without being able to spot them). It seems like time and time again I’ll inadvertently demolish a web — usually a minor one. Check this fine example from Marita’s place. It was right across the back garden path to the clothes line. Fortunately Marita spotted it before anybody walked through it. Unfortunately she then forgot about it, and walked through it herself later in the day. Whoops. Looks huge – or was it just the angle of the photo? @Roger, it was pretty big. I avoid walking under some trees in our street for the fear of walking through an overnight built web. Not so much fear of the web, but fear of looking like a idiotic ninja, trying to get out of the web! That web is massive. I bet Miss M was finding bits in her hair for ages later. That would take some time to get out of hair. That is magnificent. Really beautiful. I’ll forgive Marita walking through it, since it was inadvertent. I’ve done that myself. The paths in my back garden wind between trees, shrubs, trellises, clothes line posts… and of course, all these structures make excellent anchor points for webs, which invariably end up stretching across the path and getting walked into the next day when the sun comes out. I agree with your opening remark: It’s a pity that the otherwise incredible spidery brain, so well evolved for creating these awe-inspiring feats of engineering, hasn’t evolved quite enough to work out where best to construct them. What an amazing web! I’m not sure I’d want to encounter the spider that created it (although it would probably end up being a disproportionately tiny one). I have always spent a lot of time on my garden,but it seems in recent years the garden spiders of several types are more and more prevelent…as under our house too. Is this something to do with climate change? Why? Just recently I was cutting back a small bush and was bitten on the finger. Must have been a spider. First time ever for me. I forget my gloves and the finger became red and swelled up. The bite took several days to heal and was quite sore. I used ice packs and and took some Panadeine painkillers. Death to all Spiders is now my motto ! A beautiful web. And just like circumrential streets in Melbourne suburbs the spacing of the ‘orbitals’ increases with distance from the centre. Don’t kill the spiders in your garden. They eat all the nasty bugs that devastate your garden plants. The more spiders you kill, the less nice your garden will become. Just remember to wear gardening gloves. @Brian: Most likely the bite infected rather than was venomous, and it could have been an inch ant – my mum got bitten by one, and had to have antibiotics to fix. 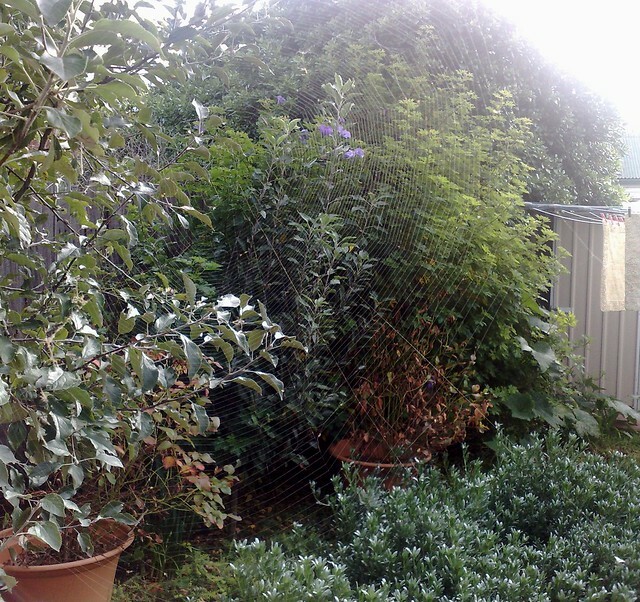 There’s some huge orb-weaver spiders in her garden, both the web and the spider. I don’t think the bit was infected . I acted promptly and used Betadine on the sore finger.